I have been staring in amusement at Bernanke's latest proclamation: Danger of downturn appears to have faded . Despite a recent spike in the nation's unemployment rate, the danger that the economy has fallen into a "substantial downturn" appears to have waned, Federal Reserve Chairman Ben Bernanke said Monday. The Fed's powerful doses of interest rate cuts, the government's $168 billion stimulus package, further progress in the repair of problems in financial and credit markets, a gradual ebbing of the drag from the deep housing slump and still solid demand from abroad for U.S. exports should help the economy over the remainder of this year, he said. Wishful Thinking or Blatant Lie? Bernanke's statements are like standing in front of a tsunami proclaiming "The Worst Is Over" before the wave even hits the shore. Professor Depew called Bernanke on his statements in point 1 of Tuesday's Five Things: Bernanke Says There's Never Been a Better Time to Sell Your Gold Jewelry for Cash . Here's my take: Before we can say the worst is over or the danger has passed, the storm has to reach shore first. With that in mind I thought it might be interesting to look at a few headlines of things that are going to happen but have not happened yet . Future U.S. bank failures linked to the downturn in the real estate market may include "institutions of greater size" than in the recent past, Federal Deposit Insurance Corp Chairman Sheila Bair said on Thursday. I talked about the expected wave of bank failures in Too Late To Stop Bank Failures . We have yet to see the fallout from the downfall of the monolines (Ambac (ABK) and MBIA (MBI)) but we will. 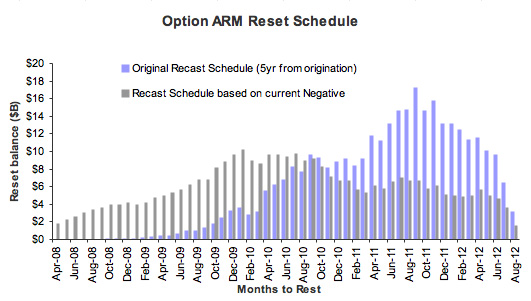 By April, 2009, hundreds of thousands of option ARM mortgages will begin resetting, bringing on a fresh wave of foreclosures. According to Credit Suisse (CS), monthly option recasts are expected to accelerate starting in April, 2009, from $5 billion to a peak of about $10 billion in January, 2010. Today, outstanding option ARM loans in the U.S. total about $500 billion, about 60% of which were sold to California homeowners, according to Credit Suisse. Option ARMs were especially popular in the state, where they were heavily marketed during the boom by such companies as Countrywide Financial (CFC), Washington Mutual (WM), and Wachovia (WB). "Most of the public is thinking that the subprime thing is over, but this is another thing waiting," [said Chandrajit Bhattacharya, vice-president and mortgage strategist at Credit Suisse Securities]. By the way, that article is not contrary to what I presented in Greenspan Conundrum In Reverse . The problems with Pay Option ARMs are negative amortization, falling home prices, and payment shock. Those are far bigger problem right now than the risk of rising interest rates on regular ARMs that are about to reset. The economic picture is worsening across the board. And not just in the US but in the UK and Europe as well. A housing bust is now underway in the UK. Inquiring minds may wish to consider UK Housing Market Seizes Up . In the meantime, Until Things That Have Not Happened Yet Do Happen , it defies credibility to suggest that danger has faded. The above is a discussion of "the known". There is also a huge risk factor from a Black Swan Event . In December he lectured bankers at Société Générale, France's second biggest bank. He told them they were sitting on a mountain of risks – a menagerie of black swans. They didn't believe him. Six weeks later the rogue trader and black swan Jérôme Kerviel landed them with $7.2 billion of losses.